Third Party Providers face very different challenges than others. You manage the warehouse business for other businesses. And you are a warehouse business of your own, comprised of those clients, a warehouse of warehouses. Each client has their own products, specs, timetables, seasons, and demands. 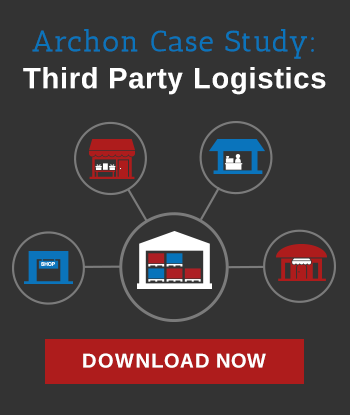 As a 3rd Party Provider, you have to have the flexibility, agility, and ability to address each individual client and their warehouse needs…track it all and be totally accountable. You have to, literally, be them. Not surprisingly, paper programs struggle to keep pace with the needs of 3rd Party clients and cookie-cutter software programs cannot accommodate their varying specs and demands. Add-ons to ERPs are not built for the job either; their capabilities are, at best, generic rather than customizable and highly specific. Archon Interactive solutions are just as our name says – “interactive.” That is, they are tailored specifically, client by client. Our custom software manages each client’s warehouse needs individually and comprehensively: i.e. receiving limits, bin replenishment levels, damage or quarantine notifications, order prioritization, real-time inventory levels, and easy immediate access to all data. Additionally, our software manages the business of managing your clients – that is, your overall warehouse of warehouses – your business. It tracks and cumulates the data for your company, providing you with the ability to see where your business stands, high and low activity levels, client patterns and trends, where issues can be anticipated, how to keep your staff knowledgeable, on task, and accountable…again in real time with real and easy access. Our software is dynamic – it evolves and adapts seamlessly as you gain clients, meet new client requirements, and your own needs, or your clients change. You know that mixed feeling you get when you land a new client – “Great, new business…uh-oh, how will we take care of them?” You won’t have that feeling anymore. You’ll take them on, meet their warehouse needs and grow your own warehouse of warehouses. We’re happy to provide details, and a demo customized for your particular situation.